I wanted to build an Windows Phone 7 app called “Stuff I Like”. 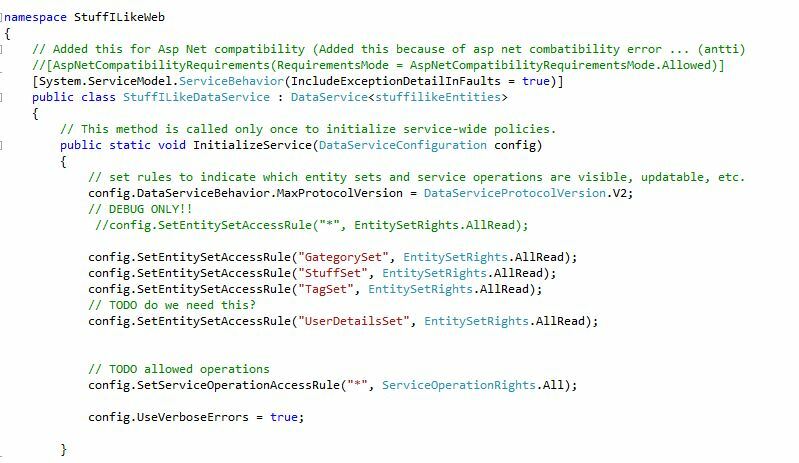 App would have OData service running in Azure and client that would cache and sync to that service. In previous post I wrote about stuff that I learned building the WP7 app. In this part I will reveal my findings on the service side of things. In the next post I will dwell into Authentication side of the app. When I followed this Data service in the cloud http://msdn.microsoft.com/en-us/data/gg192994. 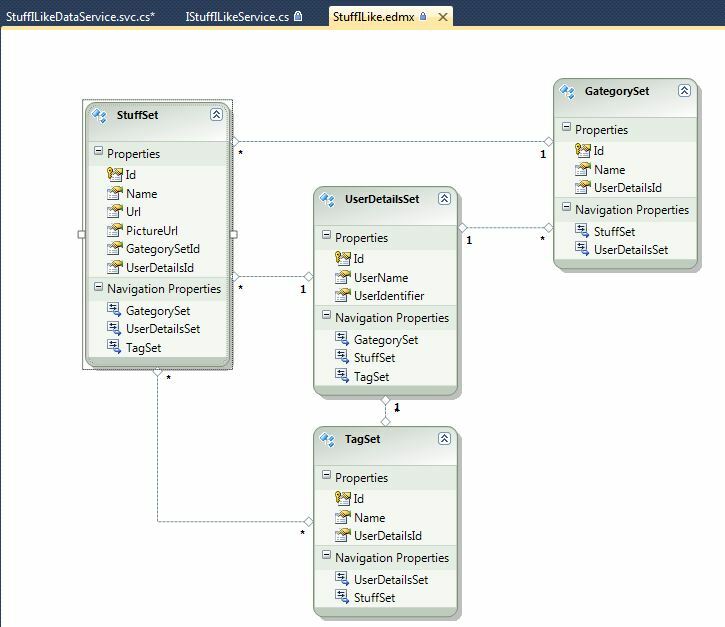 I decided to design the data model using visual studio design tool. After playing a round with the tool I managed to “draw” data model and after that it was just a matter of syncing it to Database. After Debugged EntityAccessRules with simple “*” allowRead just to check that I had not made a typo I quickly found out that I indeed had 😦 So I after I fixed a typo in EdmRelationshipAttribute and it caused the exception. After that stupid mistake things started to look better. This is how OData feed looks before you tweak it a bit. Another thing that took me couple of hours to figure out was that Explorer does not show all OData results in consistent way. So before you start heavily debugging check the returned html page source code and you should see expected result in XML format. OR you could use another browser. For example this call did not seem to return anything http://localhost:57510/WcfDataServiceStuffILike.svc/StuffSet(guid’cf1bfd2f-99f3-4047-99f8-22bc1aad1b99′)/GategorySet until I checked the source code of this page. So that’s it. Using Visual Studio this was quite easy and I actually spent most of my time figuring out why some configuration did not work than making the code. This might be due to the fact that I have “unclean” dev environment or I made lots of changes to above demos while I followed them. This was mainly due to the fact that I wanted to build my own app and not simply type in demos and labs. Liked the article. I am attempting to re-produce with my STUFF not the authors. Will advise if it turns out bad.